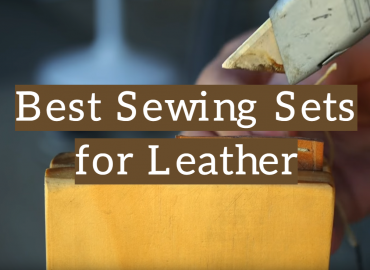 Leather has the potential to last a lifetime, but with regular exposure to outside elements, like water and salt, it will quickly wrinkle, scuff, and dry. Don’t bring shame to this naturally brute material by hiding your leather goods deep in the bowels of your closet. Regular applications of leather oil will keep your skin-based footwear, accessories, and upholstery looking youthful and soft. 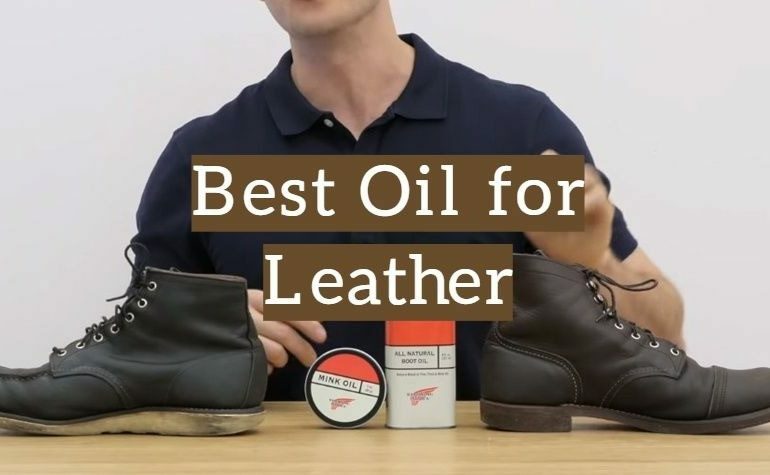 Read along to discover our top ten leather oils and then dive into our comprehensive buying guide to make the most out of your pick. Obenauf’s hydrating oil concoction comes in a black and gold bottle that looks s though it’s fit for a king. However, it’ the compound’s rich mixture of beeswax, propolis, and natural oils that make it one of our all-time favorites. A few daubs of Obenauf’s will restore the flexibility and sheen in boots new and old. Of course, you shouldn’t limit your Obenauf applications to footwear. This leather oil blend works well on nearly any leather item, including leather furniture, clothing, and vehicle upholstery. As an added bonus, this product is manufactured in the good old U.S.A. If your leather had a voice, it would be pleading for Bickmore. While the engine oil-like packaging is a bit deceiving, there’s no question that Bickmore is a pure and, ironically, petroleum-free product that is designed to breathe life into a wide range of leather products. Save the environment by adding a drop or two of this leather anti-aging oil to your cowhide boots, belts, baseball gloves, and more. You’d be hardpressed to find 32 ounces of any oil for a lower price. Not one to join in on the hype surrounding new products? 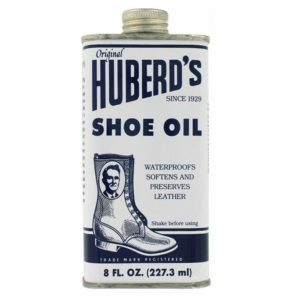 Huberd’s Shoe Oil is a time-tested leather conditioner that has been dominating the leather product market since 1929. The oil comes in a retro-looking tin flask adorned with an old fashioned blue and white advertisement. While the long-seated Arizona company isn’t likely to release the full list of ingredients in their leather conditioning formula, they do ensure that it contains only non-toxic substances. Does Red Wing Footwear ring a bell? The company is well-known for producing U.S. military footwear. With original marketing done by painter Norman Rockwell, the company has earned its well-established reputation for retro chic designs. Alas, it’s really the tried-and-true combination of mink oil, lanolin, and silicone that make this leather conditioning oil so fabulous. With ingredients so yummy and hydrating you might even consider putting it on your own skin, you can imagine how lush leather looks after a coating or two of Red Wing. 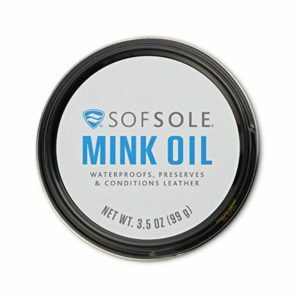 If your someone looking to waterproof and restore your leather footwear, Sof Sole is definitely a viable option. 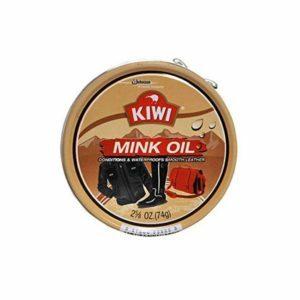 This mink oil mixture comes in a small resealable tin. It’s easy to apply and contains minimal ingredients. While some customers complain that the oil has a rancid smell, we experienced nothing of the likes. In fact, it only took one coat of Sof Sole to eliminate years’ worth of scuffs and scratches on the surface of our test pair of brown leather boots. Many people don’t realize that you can use oils to restore the condition of both vinyl and leather fabrics. 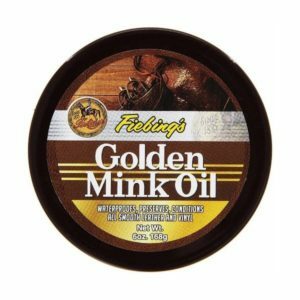 Fiebing’s golden-hued mink oil contains a blend of silicone, lanolin, and vitamin E. If these ingredients sound better fit for a high-end facial salve, that’s because they are. Feibing’s American-made product can remove years of abuse, including water, salt, and perspiration stains. It even provides a naturally waterproof barrier that helps prevent future liquid-based abuse. The best part is that there is really no limit to what Feibing’s can be applied to. 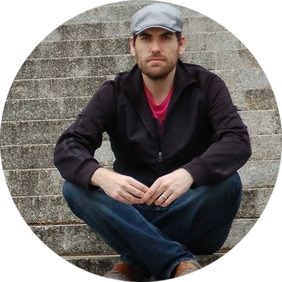 So, pull out your old baseball glove, those second-hand cowboy boots, your dog’s leash, and everything in else. Some people make a lot of fuss when it comes to conditioning their leather products. However, Angelus makes it easy to tip back a bottle of oil for rapid results. While this neatsfoot formula doesn’t penetrate too deep, it does make leather softer and more weather resistant. If you live somewhere with high humidity or just subject your leatherwear to intense situations, it’s a wise idea to keep a bottle of this low-maintenance product on hand. With baseball season around the corner, it’s also not a bad idea to present your budding little leaguer with a bottle of their own. Trust us; oil is far faster and more productive method than clubbing your baseball glove to death. 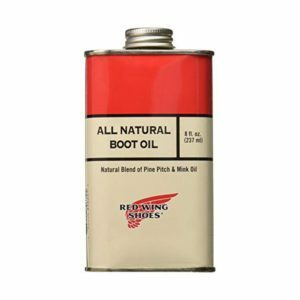 Whether you are going for that well-groomed time-traveler look or hipster chic, a single flask of Red Wing Shoes’ vintage-inspired boot oil will have your leather looking as scrumptious as it would if it were fresh off the cow. Too graphic? Well, this U.S.A.-made leather oil is made from a blend of all-natural mink oil combined with pine pitch. While we aren’t alchemists, a quick application of Red Wing tells us this seasoned manufacturer is bottling some sort of magic. After a brief rubbing, our test wallet looked darker and felt softer. Not to mention, water beaded on the surface when it was exposed to rain. Are you looking to do more than boost the aesthetics of your outdoor gear? 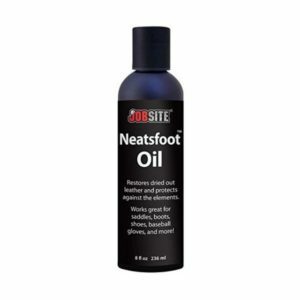 JobSite’s Neatsfoot Oil is a favorite amongst professionals looking to add a protective layer to their vinyl and leather boots. Of course, it’s also a popular remedy for dried and worn leather furniture and automobile upholstery. While the formula does tend to darken any preexisting tan, the leather comes out noticeably flexible and soft. If you’ve ever wandered through the cleaning isles of a supermarket, you’ve probably come across one or more Kiwi products. While most people think of the company’s thin little tins of shoe polish, their spreadable mink oil is a favorite among leather product enthusiasts. The rich natural formula is ultra easy to apply. It can be put on everything from black to white leather. Not to mention, it is suitable for suede and nubuck too. The anti-aging formula includes mink oil, silicone, and lanolin, all of which are great for smoothing out wrinkles and filling in scuffs. This leather oil is super affordable and great to have on hand if you wear boots or leather gear regularly. 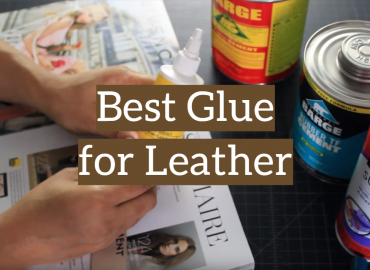 Still wondering what to look for in a quality leather conditioner? In the next section, we give you the rundown on common leather oil ingredients and the quality results they bring about. As you’ve probably already noticed, leather oils consist of either neatsfoot or mink oil. 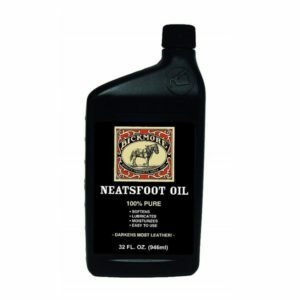 Neatsfoot oil is made from the feet and shin bones of cattle. 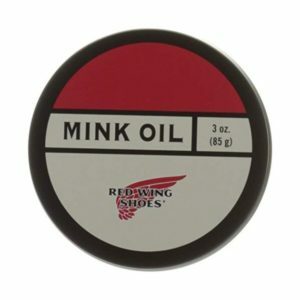 Meanwhile, mink oil is made from the fat that is removed from mink pelts. Both of these oils are ideal for restoring and conditioning leather, but each has its own proven perks. 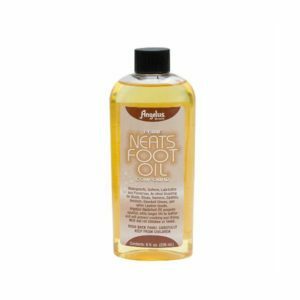 For one, neatsfoot oil is well-known for its ability to hydrate and add shine to leather products. On the downside, it tends to darken light leathers and can even break down natural and synthetic threads. On the other hand, mink oil is ideal for waterproofing and added protection. However, it fails to penetrate deeply and needs to be reapplied more frequently than neatsfoot oil. Light-colored pine pitch is often added to mink oil in order to enhance leather’s naturally protective barrier. Pine pitch helps improve the waterproof qualities of leather. Since it is a naturally derived substance that contains no synthetic additives, it gets two thumbs up in our book. Pine tar is a bit different from pine pitch, though it undoubtedly comes from the same tree. It’s basically a natural preservative that is often used to treat leathers. Nevertheless, it is far less common than pine pitch. Beeswax is often combined with mink or neatsfoot oil to make it thick and spreadable. But this all-natural product is more than just a base for oil-based leather conditioners. In fact, it helps waterproof leather and fortifies leather’s exterior fibers. Not to mention, it gives it a faint yet noticeable sheen. Lanolin is a natural oil that is derived from sheep wool. It is a popular additive to skin salves and lotions, as it naturally softens and enhances the flexibility of skin. With that said, lanolin makes leather feel more delicate and pliant. Keep in mind that lanolin is extremely potent and may take away from a hardy patina you’re looking to preserve. Some leather oil manufacturers toss a bit of silicone into their mixes. While it may seem contradictory to combine a synthetic substance with otherwise all-natural ingredients, silicone has some powerful waterproofing characteristics. As such, it yields excellent results on smooth leather boots and other outdoor accessories. Vitamin E is applauded as an anti-aging serum for skin. 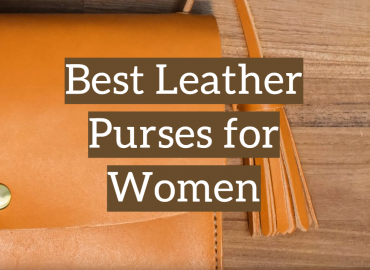 As such, it comes as no surprise that it’s also super beneficial to leather. A little bit of Vitamin E goes a long way to moisturize leather and prevent future damage. Propolis is yet another honeybee-derived material. It is a resin that comes from honeycombs. 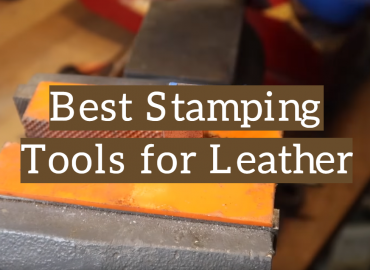 It’s great for filling in scuffs and indents on the surface of well-worn leather. In fact, it acts as a natural varnish. While we explored the various benefits of individual ingredients, it’s important to look at all of the potential perks of leather oil. Most people find themselves searching for leather oil when their animal hide products become noticeably worn. Scuffs, wrinkles, stains, and discoloration are just a few of the common blemishes we see on old or abused leather. A high-quality leather oil can erase years of use and exposure to the elements. What’s more, it can penetrate deep below the surface to hydrate and restore leather’s internal fibers. As a result, oil-treated leather often appears darker, more uniform, and more supple than leather that has been left to age on its own. On top of that, some leather oils can help soften leather fibers in newly manufactured animal hide products. As such, many people apply them to new boots or gloves in an effort to break them in faster. High-quality leather products have the potential to last for hundreds of years. In fact, some of the oldest manmade artifacts are made from well-preserved animal hide. Regular and consistent oil rubs help extend the life of leather products, helping you to get the most out of your money while reducing your household waste. While leather is naturally durable and rugged, oil can help fortify it against harsh elements like water, salt, and dirt. I fact, regular oiling ensures that your leather goods can handle daily wear and tear. Not only will your leather products deteriorate slower, but they will also maintain a like-new exterior. If your leather products are looking worn and tired, it may be time to give them an oily massage. Seriously! 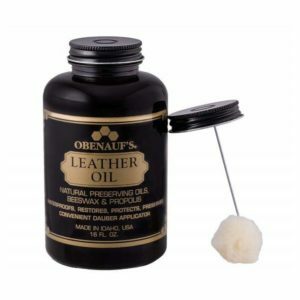 A well-made leather oil can dramatically extend the life of your animal hide products. Not to mention, it will have them looking better and feeling softer than ever before!